Slow-cooker dinners are practical and easy for people who are on the run. And crockpot pork roast is no exception. You can slow cook a boneless pork roast by itself, or you can dress it up by adding your favorite herbs and spices. Add additional ingredients, such as potatoes and carrots, to this basic recipe, and you will have a whole meal waiting when you return home from a long day. 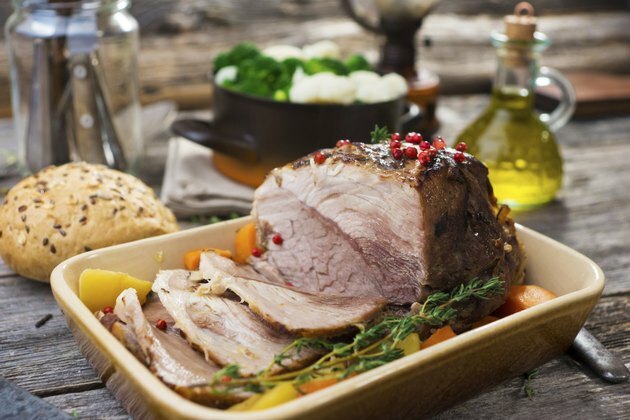 If you choose a large enough pork roast, you are bound to have easy leftovers for later. Choose a 3- to 5-lb. boneless pork roast appropriate for your occasion. Remove the packaging from the pork roast, and pat the roast completely dry with clean paper towels. Season the pork roast by sprinkling all sides of it with pepper and salt. Additionally, if you prefer, you can create a ground mixture of your favorite herbs and spices, and use it as a dry rub for the roast. Add sliced onion to the crockpot, if desired. Place the seasoned pork roast on top of the onion. If you prefer to omit the onion, simply place your roast directly into your slow cooker. Pour the chicken broth into the crockpot over the pork roast and onion, and replace the lid. Cook the roast at your crockpot's low setting for seven to eight hours, or until fork tender, for a 2- to 3-lb. roast. Cook the roast at your crockpot's high setting for six to eight hours, or until tender, for roasts weighing more than 3 lbs. Remove your slow-cooked pork roast from the crockpot, slice it and serve it warm. In addition to onion, you can add other vegetables, such as carrots and potatoes, to the crock before setting the pork roast on top of them to cook.